The Bentley Continental GTC V8 2012 made its appearance on the US market earlier this year during the Detroit Auto Show. When compared to the previous model the new Bentley Continental GTC boasts improved fuel consumption while delivering more power, a wider range of customization options, new styling as well as a new engine. The new engine is a 4.0 liter V8 which develops 500 horsepower and 487 lb-ft of torque while delivering a fuel economy of 15 mpg city and 24 mpg highway. Despite the fact that the car weights roughly 6,400 lbs, the new Bentley Continental GTC V8 2012 is able to go from 0 to 60 in just 4.6 seconds and can reach a top speed of 180 mph. 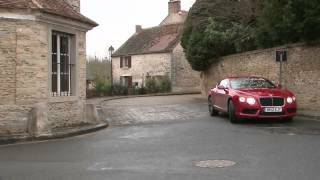 The 6.0 liter W12 engine is also available for the GTC 2012, but honestly, there isn't much difference in performance when compared to the V8 so Bentley did a really good job with the new V8 engine indeed. The 6.0 liter W12 produces 567 horsepower and 516 lb-ft of torque, and goes from 0 to 60 in 4.5 seconds which means it's 0.1 second faster than the V8. In terms of top speed the W12 engine makes a bigger difference, the engine being limited to a top speed if 195 mpg. When it comes to fuel consumption the W12 covers 10 mpg city and 17 mpg highway. The Bentley Continental GTC V8 2012 sports a six-speed QuickShift automatic gearbox which sends its power to all four wheels. The all-wheel drive system has also been improved in the new Continental GTC, a wider track width sending 60% of the power to the back wheels and 40% to the front wheels. The exterior of the Bentley Continental GTC V8 2012 has been revised, the front grille has been reshaped and some of the car's bodylines have been redrawn. The Bentley Continental GTC 2012 comes with 20 inch wheels as standard whilst a set of 21 inch wheels are made available as an optional extra. The Continental GTC features a soft-top built with multi-layered fabric in order to reduce the noise, and further improvements in this matter consists in acoustic glass and some under-body panels that add up for a better noise reduction. The inside of the Bentley Continental GTC 2012 doesn't let down. Higher quality materials have been used, the cabin has been hand-crafted and is now more spacious, the front and rear seats are now more comfortable and a brand new touchscreen-operated 30 GB infotainment system offers advanced navigation featuring seven-digit postcode entry, dynamic route guidance and Google Maps. Furthermore a very wide range of soft-touch leather color options and seven choices of wood veneers are offered as a standard, bringing the GTC 2012 to a new level of customization. As far as pricing goes, the Bentley Continental GTC V8 2012 is to be sold at roughly $189,780 which means it's roughly $27,000 more expensive than the sporty 2012 Audi R8 V10 Spyder, and a staggering $43,000 more expensive than the 2011 Porsche 911 Carrera Turbo Convertible.